A bus lane that was closed due to ongoing misuse from motorists has been reopened with a camera in place to catch unauthorised drivers. The short section of road links Garstang Road to James Towers Way, heading south towards the M55 Broughton roundabout, and aims to improve bus travel while also providing a short route for emergency services responding to incidents. The bus lane at the M55 Broughton roundabout will now issue penalty notices to unauthorised drivers using the carriageway. But despite being marked and signed as a bus lane, it has been subject to “significant misuse from some drivers,” says Lancashire County Council. The county council have since installed a bus lane camera on the road to catch drivers taking the unauthorised shortcut. County Coun Keith Iddon, cabinet member for highways and transport, said: “We want to discourage people from using this bus lane when they shouldn’t. “This lane is designed to help buses by providing them with access onto the roundabout. “James Towers Way has reduced congestion in the centre of the village. "When it opened some people instead chose to rat-run along Garstang Road, using the bus lane as a short cut. “We don’t want anyone to get caught out by these cameras, which is why we’ve introduced a short grace period. 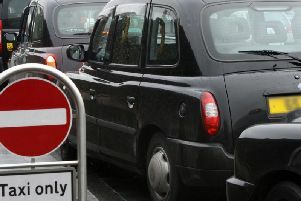 The council will initially only issue warning notices to drivers using the lane to help make people aware of the changes, ahead of full enforcement in the form of Penalty Charge Notices. The reopening comes as a £1.85m package of improvements for Broughton village has been announced, including cycling, walking and environmental enhancements along Garstang Road.